The past week, I've been writing an armory app using D-Ms IrisZoomDataApi. 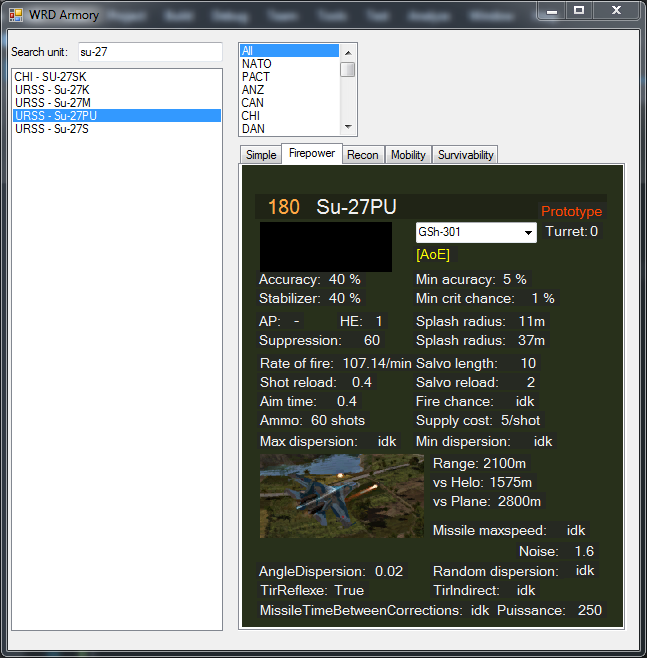 The goal is to have a program that is more user-friendly than the mod tools but still shows the important hidden stats. Even if you know how to use the mod tools, searching for units and getting an overview takes much less time. The recon tab has a custom query field. For example, if you're wondering what a mod tools variable does, you can input it there and quickly check its value across multiple units. -If the program doesn't work, make sure you have NET Framework 4.5.2 installed. Last edited by throwaway on Sat 24 Jun 2017 16:38, edited 17 times in total. can you also add air detection for planes? 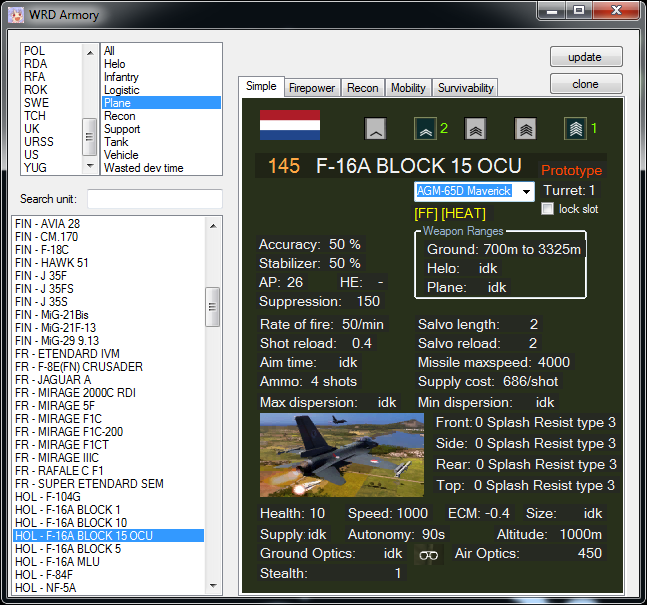 another505 wrote: can you also add air detection for planes? It should be the air optics stat, but there may be a maximum spotting range (like with ground) that I've missed. Just downloaded it , thanks! yea, saw those numbers too but can't make sense of it ingame terms, 450 means what ? another505 wrote: 450 means what ? There's some sort of interaction between the optics value and the stealth value [and whatever forests are in the way] which ultimately decides what range you spot a given unit at (capped by the max spotting range stat), but nobody has derived a formula yet, even for open spaces with no forests in the way. 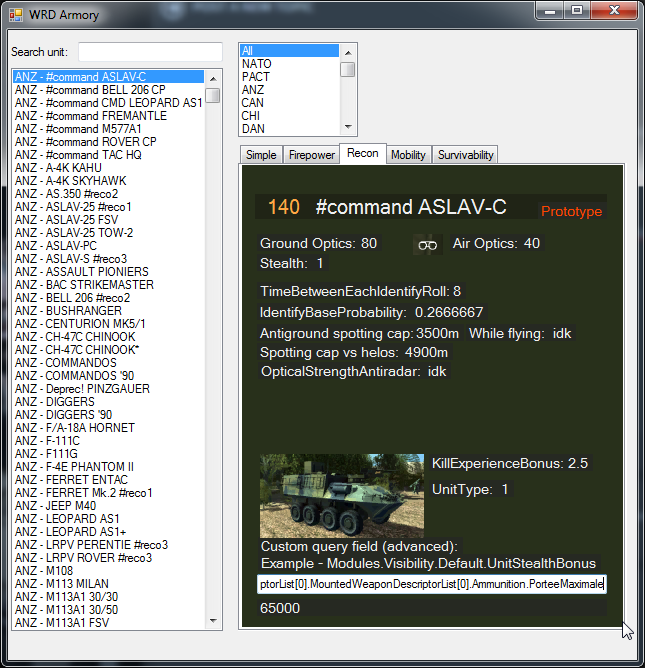 Trying to derive it myself is beyond the scope of this project, so the best I can do is show the actual values behind good/very good/exceptional (as well as showing air detection for units that don't normally show it, like manpads, and ground optics for support units). There's some sort of interaction between the optics value and the stealth value [and whatever forests are in the way] which ultimately decides what range you spot a given unit at (capped by the max spotting range stat), but nobody has derived a formula yet, even for open spaces with no forests in the way. 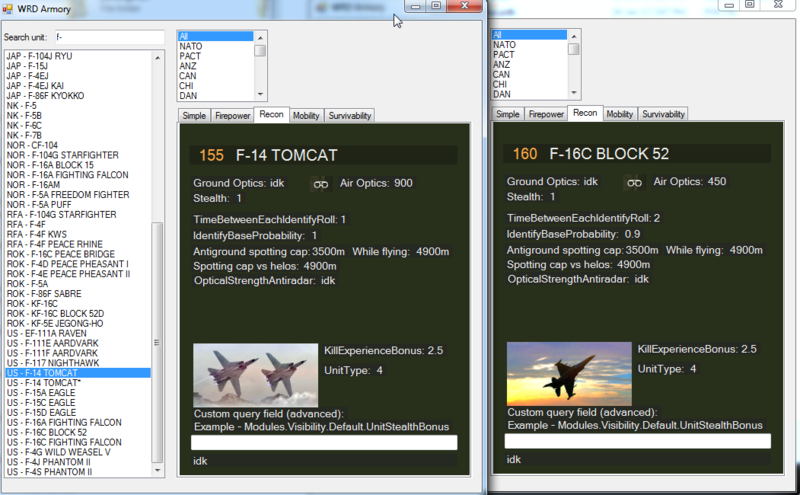 Trying to derive it myself is beyond the scope of this project, so the best I can do is show the actual values behind good/very good/exceptional (as well as showing air detection for non-support units like manpads or VBL mistral and ground optics for support units).